Happy Monday! 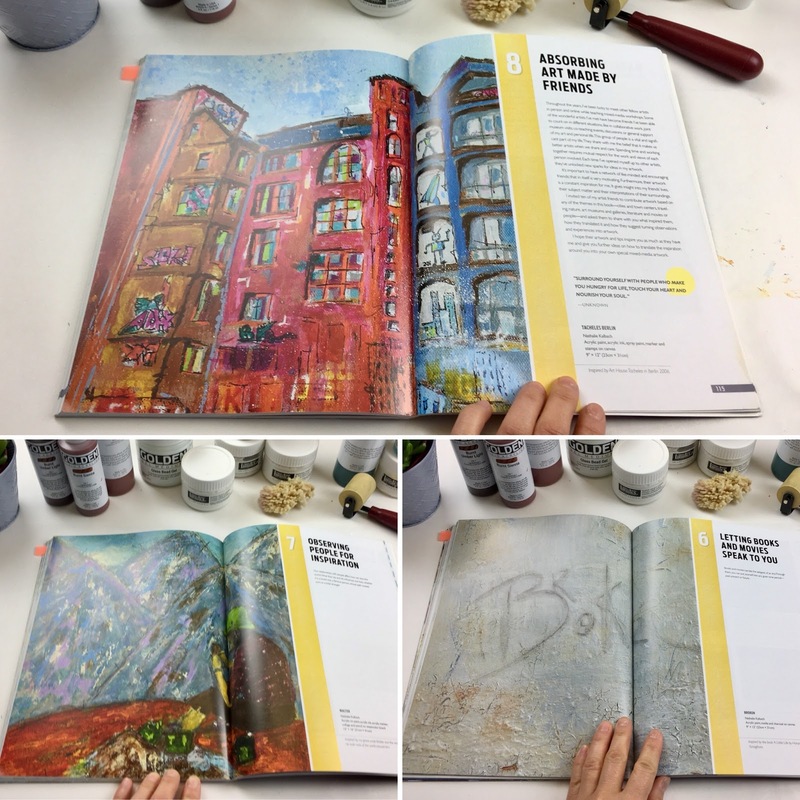 If you love art technique books, I want to share with you how I made this inspiring mixed-media piece. This is my beautiful and talented friend, Nathalie Kalbach (NathaliesStudio.com). 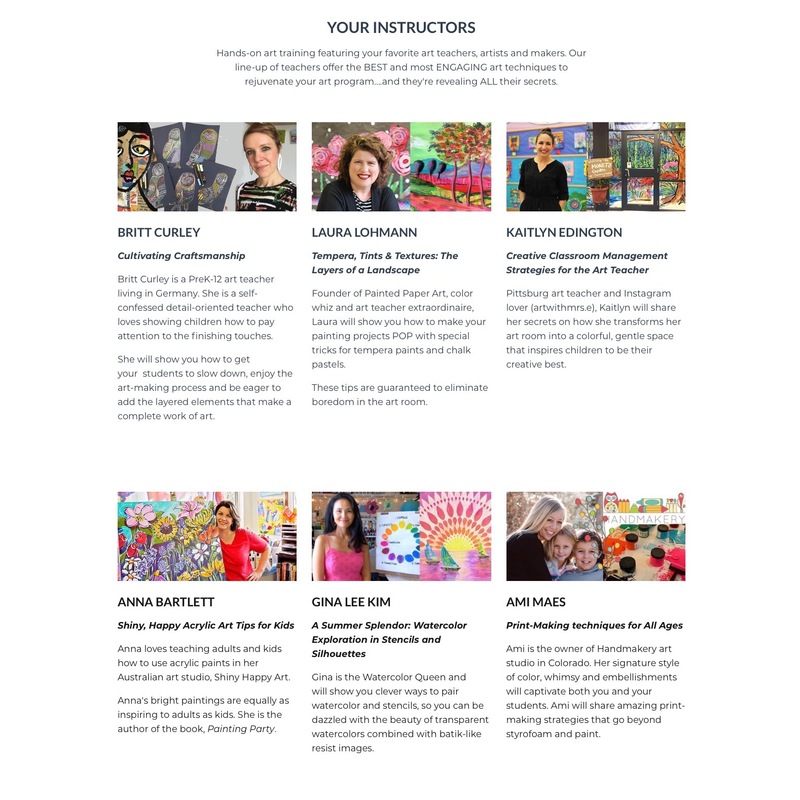 For 2 years I've had the privilege of working with Nat as one of the instructors for her annual Creative Jumpstart Online courses. 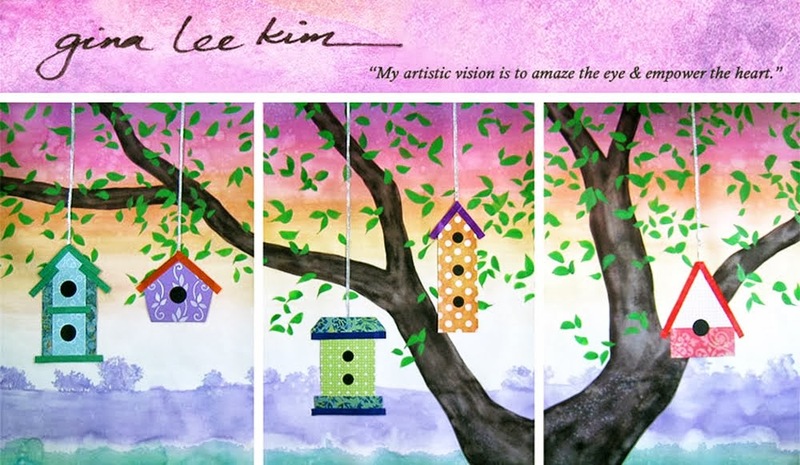 She's one of these prolific artist, compassionate teacher, designer of cool art products and an amazing creative. And she wrote this fabulous mixed-media book on how to create remarkable, textural and deeply personal art--entirely from what simply inspires you. It's titled: Artful Adventures in Mixed-Media. Instead of writing a review with lot of words, I wanted to demonstrate how amazing this book is. 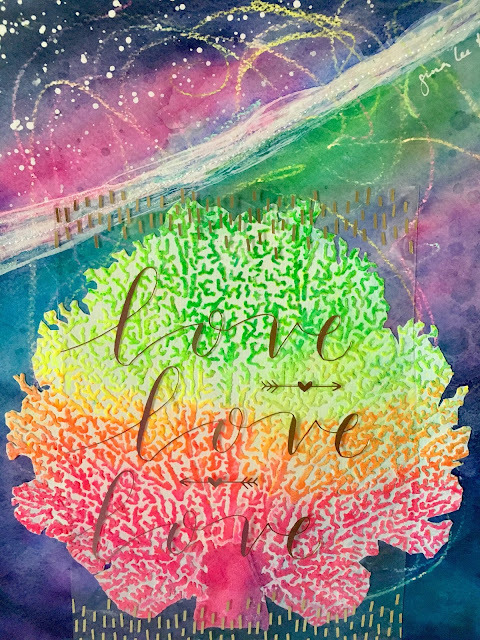 I decided to try out one of her techniques found in "Chapter 3: Getting In Touch With Nature"
(page 44-49) and the results were beautiful! Part of the fun was gathering all the supplies from the material list. As a watercolorist who uses mixed-media, I was thrilled to have all of the acrylic media on hand. Enjoy a quick hi-speed demo. 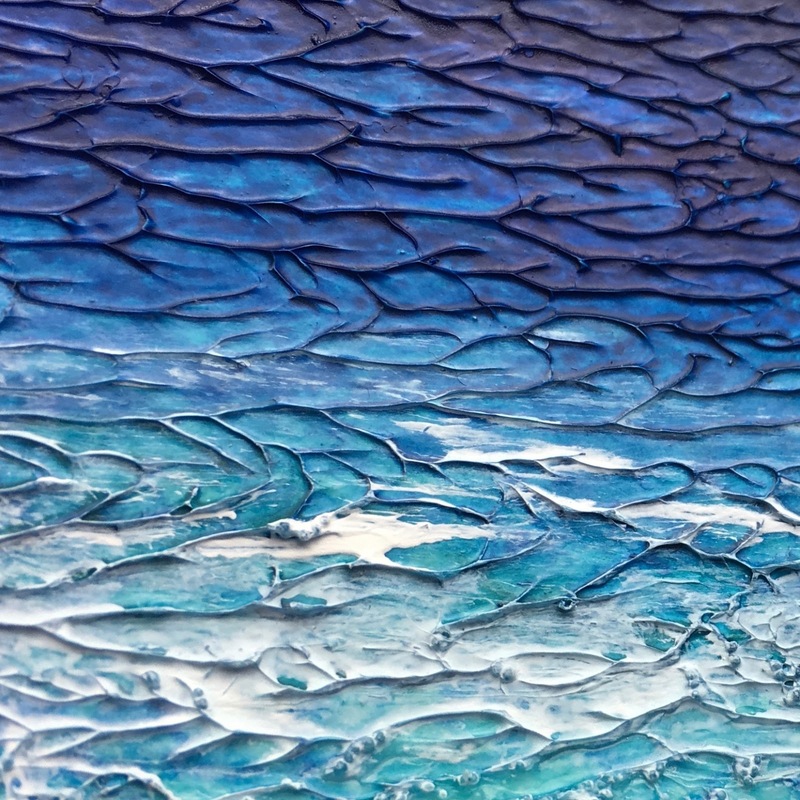 I think it truly captures the energy and yumminess of all the layers coming together to create a stunning, cohesive piece. 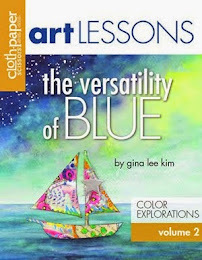 Artful Adventures (Hi-Speed) from Gina Kim on Vimeo. Here's a little more sneak peek into Nat's book. 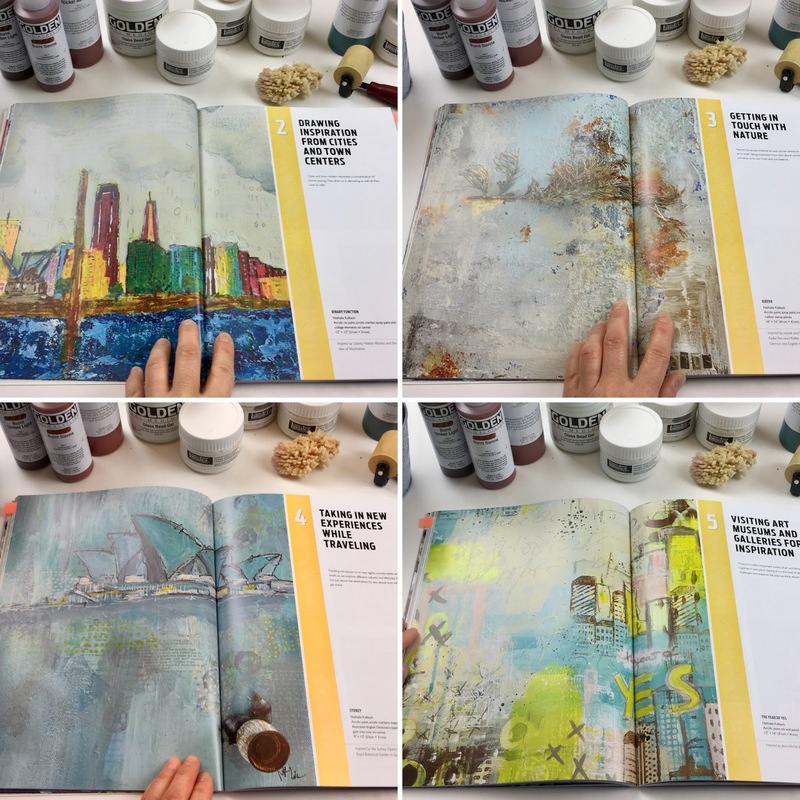 Notice how beautiful each chapter book spread convey the overall feel of each mixed-media content. 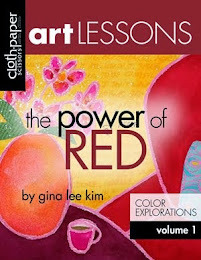 This book is full of useful art supply information and such helpful tips on where to find your inspiration. 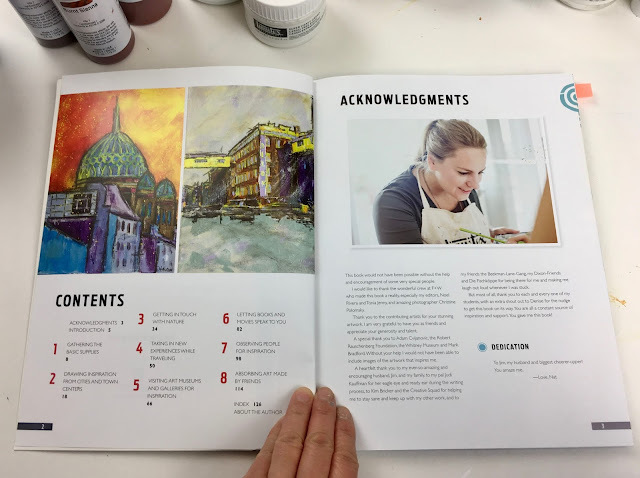 And Nat is so generous; she has a chapter for other artist-friends where they share their unique talents and creative insights. This book is a gem. 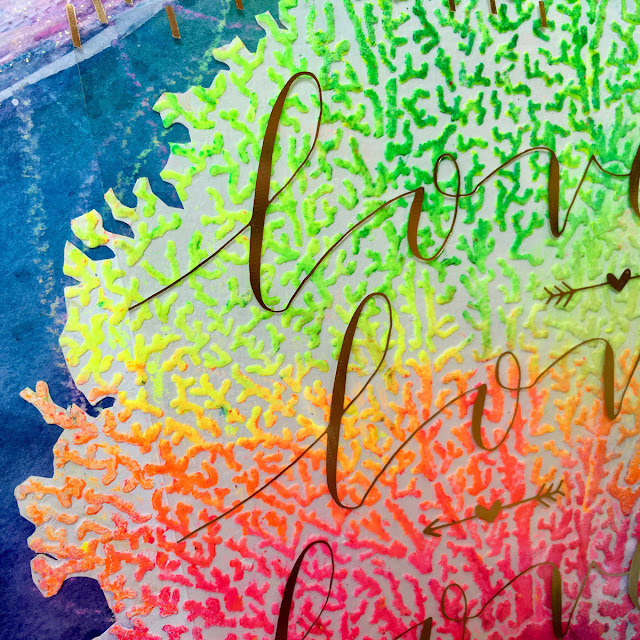 Rich in color and depth, it celebrates the beauty and texture found in life. 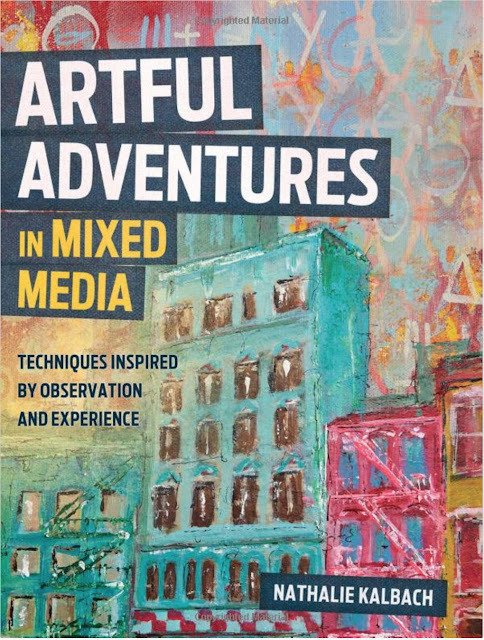 Artful Adventures in Mixed-Media is one of those books you'd want to have as your mixed-media home library. p.s. 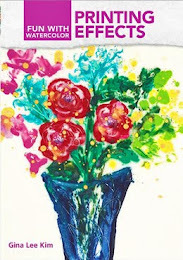 if you do order Nat's book (or have ordered it in the past), would you be so kind to take a moment and write a review? Reviews are so helpful to a published artist and author. They are deeply appreciated. Happy (Complicated) Mother's Day. You Are Loved. I realize today I stand with so many survivors on a sensitive subject: Mother’s Day. I lost my mother in a car accident when I was ten years old. It was one of the loneliest and painful periods of my life. And to make things complicated, my mom was not a very warm or nurturing person (which makes me compassionately curious to ask how her childhood was...probably loveless and very difficult). Mother’s Day has definitely been a trigger-word/phrase for me for many years because my household was nothing like those Hallmark commercials. Over time, I was able to flip the inner narrative to start healing and save my own life. 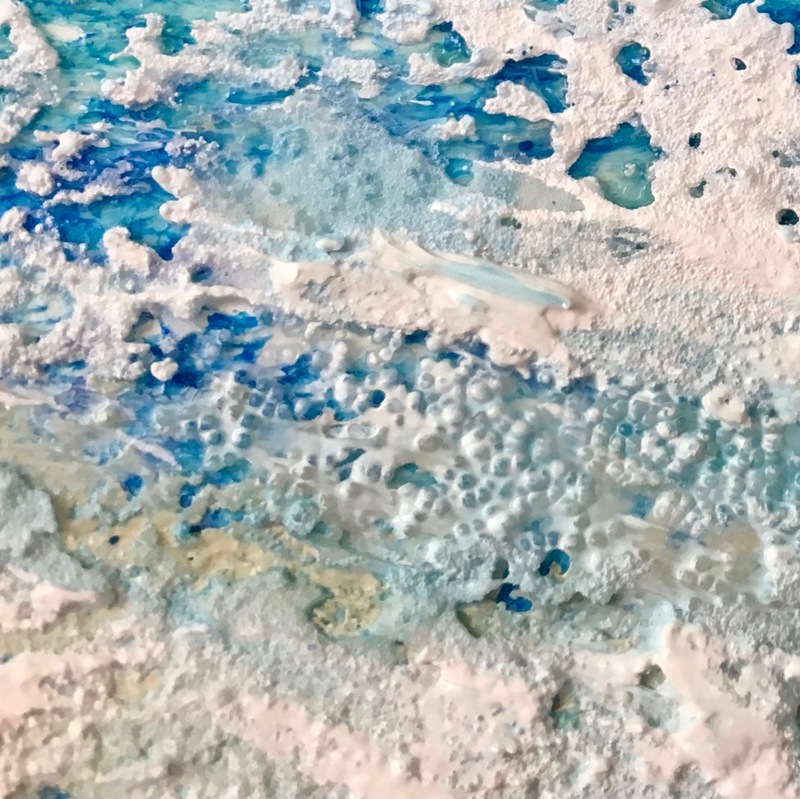 I have used art to help me—as a healing practice & meditative choice—not to eradicate pain but to live at peace with loss and to coexist with the idea of a positive relationship I never had. For whatever reason, if Mother’s Day is a bittersweet holiday for you and you’re hurting, please know you are not alone. I see you. And hold you in tenderness and in hope and in comforting thoughts. 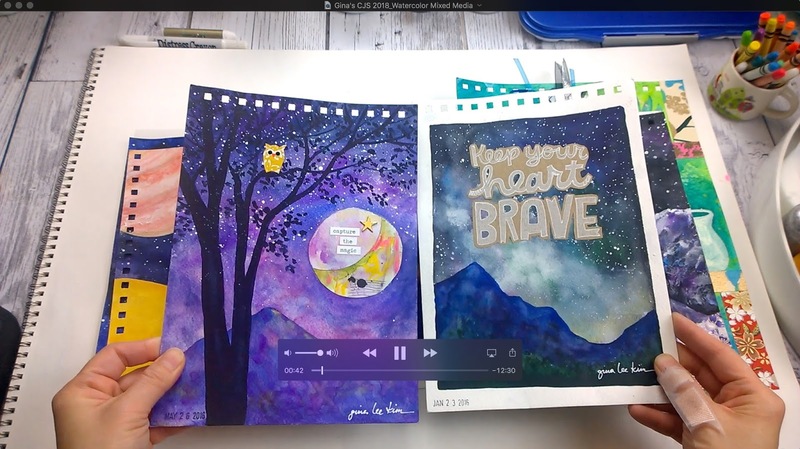 Today, 21 SECRETS is relaunching one of my watercolor & mixed-media workshops titled: “Spirit Taking Form” where you’ll learn how to make 6 vibrant art journaling pages—four of which will be published in my new book coming out this fall (and now you’ll know how I created them!). It’s all included and part of a grand offering presented as 21 SECRETS "The Best of 2014 & 2015". There are a total of 37 workshops by 38 amazing teachers. Everything will be presented in a 150+ page eBook. 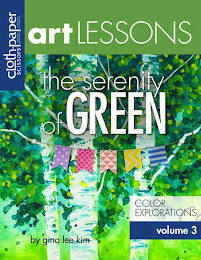 Packed with links to videos, inspirational color photos, templates, and clear instructions. 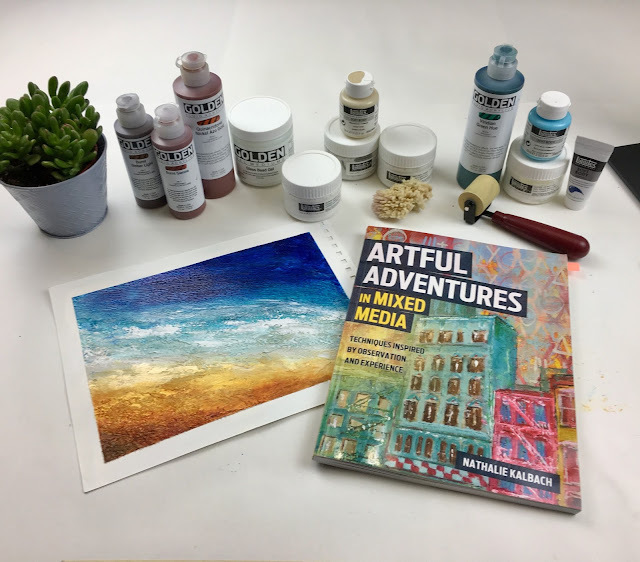 Upon purchasing, you will receive immediate & lifetime access to all content, plus membership to a private Facebook group to share your art & receive support. 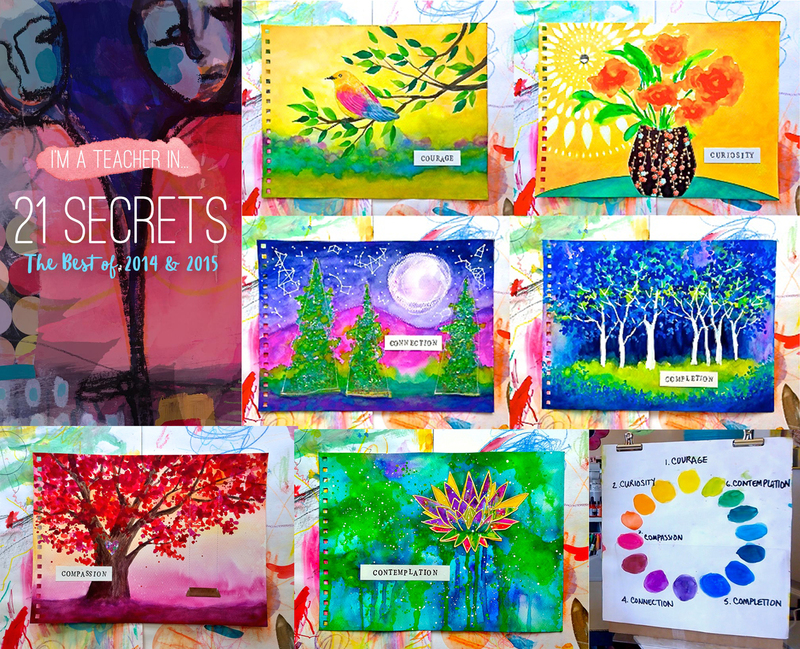 The price of 21 SECRETS The Best of 2014 & 2015 is $128. And to make things extra special: starting today, Wednesday, May 2 through Friday, May 4, 2018, you can save $21 by using coupon code: BESTOF during checkout. (Note: discount ends 5/4/18). 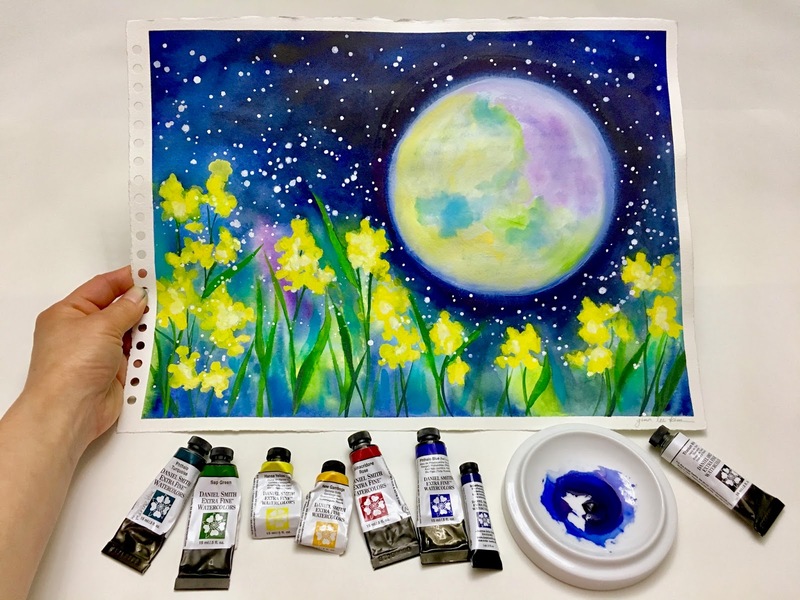 It's a total honor when Patty Palmer ––founder of Deep Space Sparkle, The Sparklers Club, and Art Made Easy Podcast––asks you to be a watercolor presenter again for their summer art education event. Instead of the conference being held in Santa Barbara, DSS will host their workshop in the comfort of your home! 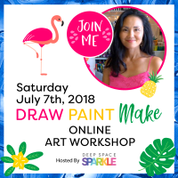 Welcome to 2018 DSS "Draw Paint Make" Online Summer Workshop! (content that you'll have access to for a year). 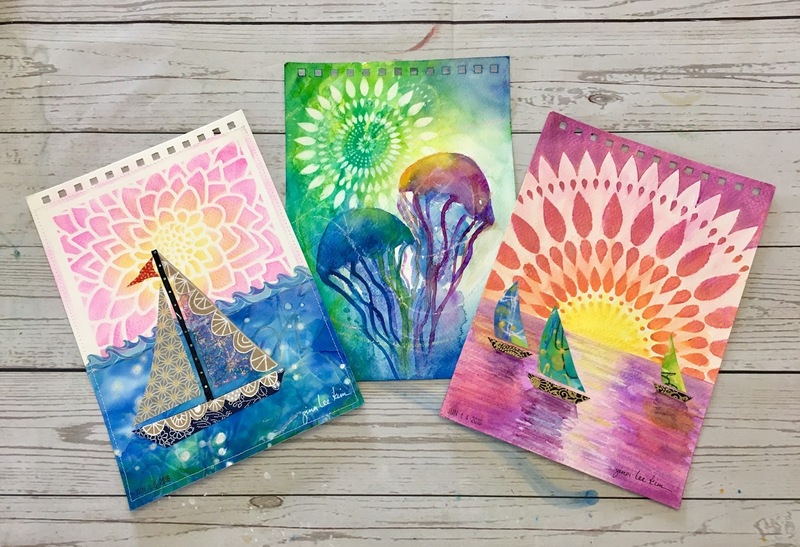 * Show you how to incorporate a variety of media, from crayons to watercolors, tobrayers to markers to acrylics into easy art projects. 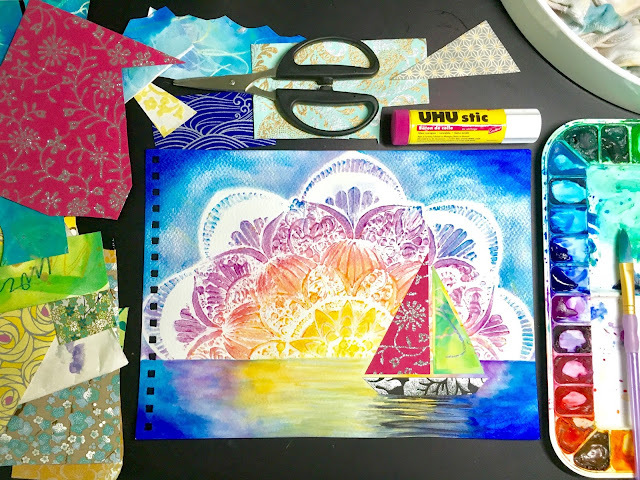 * Teach you how to hack basic art supplies to achieve amazing results. 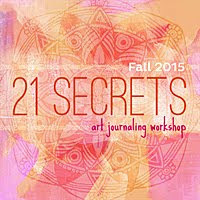 * Reveal the secret tips behind the stunning projects you see from your favorite teachers. 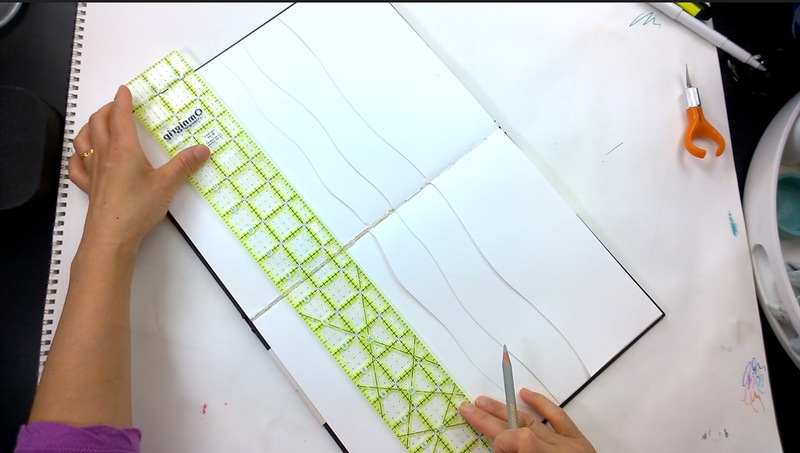 * Inspire and teach you to create amazing projects of your own. 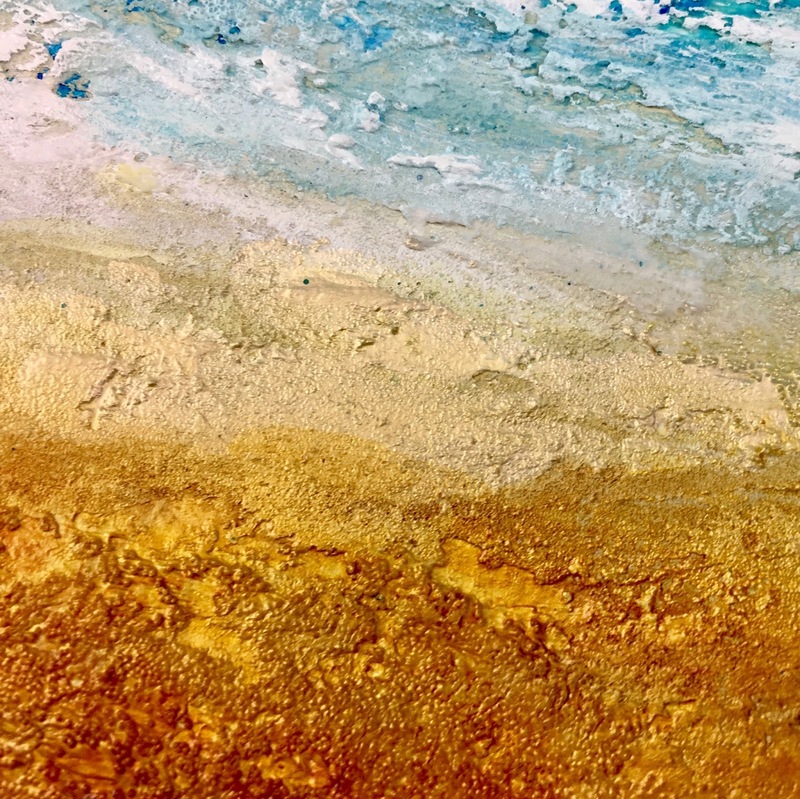 * Help you define your art space for maximum inspiration. 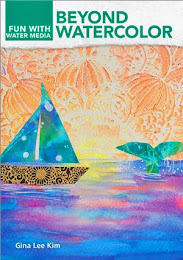 Enjoy a warm introduction from Patty about DSS Draw Paint Make online event. I'm also in the promo, about a minute into the video. It may be a 2-second footage (taken during last year's conference), but I'm thinking 'Yay! I made the cut'! 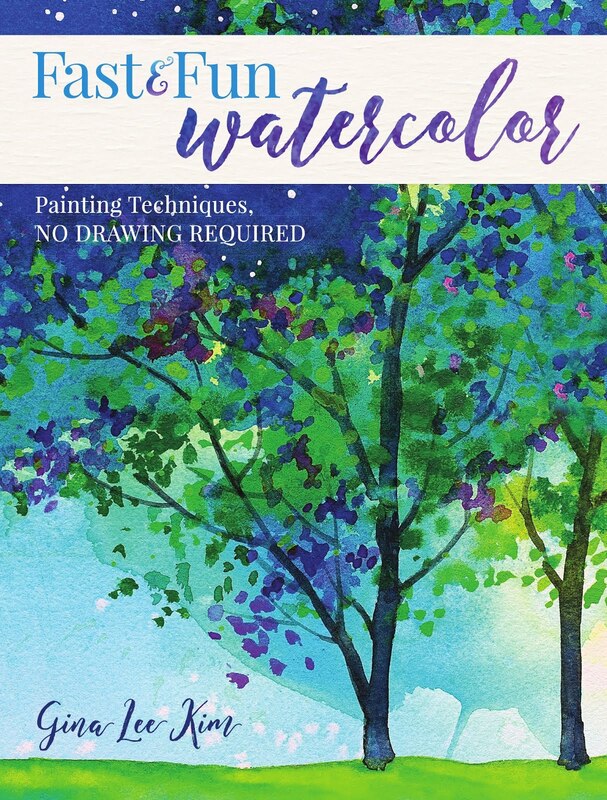 My workshop title will be: "A Summer Splendor: Watercolor Exploration in Stencils and Silhouettes"
I'm going to share some clever ways to use watercolor and stencils together. And once my tutorials go "live" during the online event, I am right there with you to assist and answer any questions during and immediately after my demonstration. 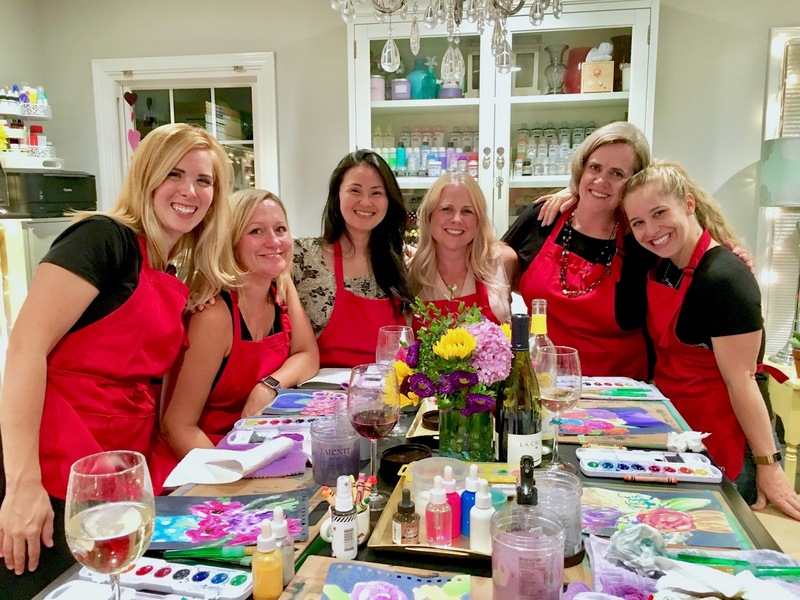 You, as a creative teacher, are important to this community. And my hope is to inspire and offer some great, useful tips and techniques––lessons that’s are equally enriching and fun! I sincerely hope you can join us! Note: DSS has over 4,000 members….members from all over the world that include parents, art teachers, homeschool educators, art studio owners and anyone that loves teaching and making art with kids (K–6th grade). Enjoy my little solar system promo. It's an honor to have my tutorial videos as part of DSS’ February space bundle. Every month DSS offers done-for-you class curriculums and professional development hours. 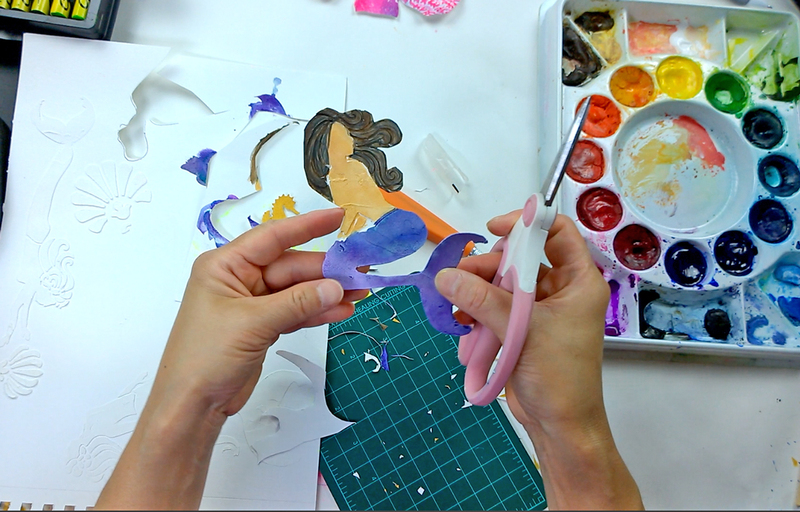 For more info about DSS, The Sparkler’s Club, and how/when to enroll, please visit deepspacesparkle.com. NEW DSS SPACE PROMO from Gina Kim on Vimeo. One of the Sparkler members asked a great question and I thought I'd share it here as well. Stephie M. asked: Why [gouache] over watercolor?...could you use watercolor and get similar effects? 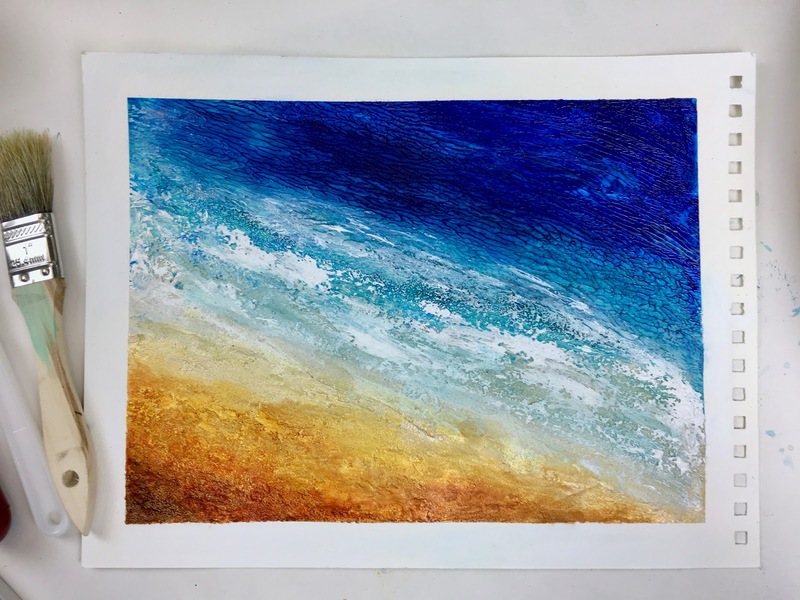 Here was my reply: Gouache is fantastically opaque and has the covering power that you need to: 1) fix the planets back to their circular shape and 2) serve as new substrate for finishing with watercolor and gouache as a last layer. 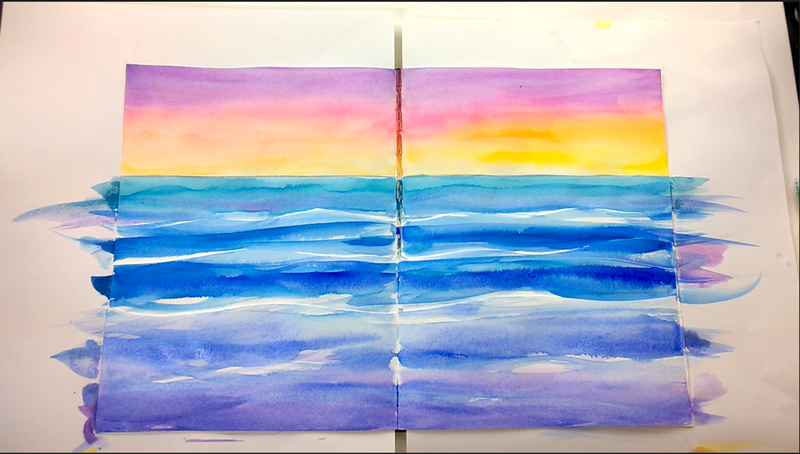 Watercolor is too transparent to achieve these objectives. 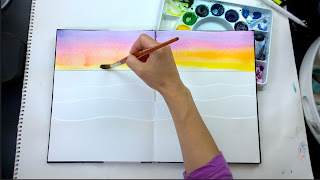 You could skip using gouache and do my lesson using 100% watercolor but if you do, you’ll need more time, more layering (called glazing) and perhaps a liquid frisket to mask off the planets first to achieve a satisfying/smooth background space wash. 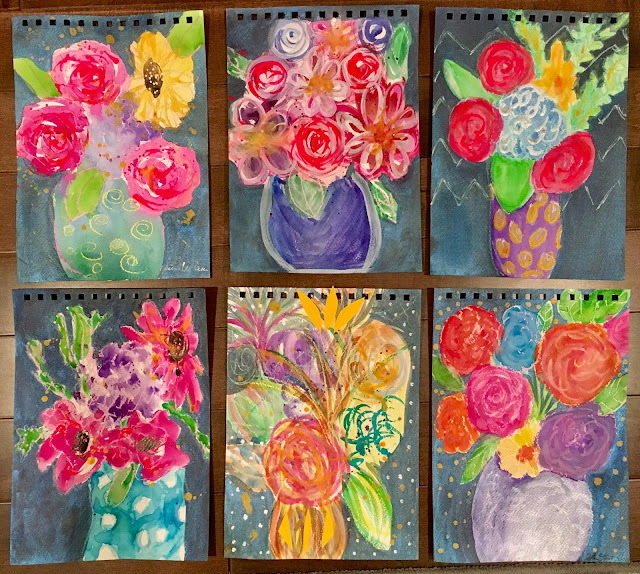 I wanted to invent a quicker painting session with minimal frustrations or technical hurdles. Hope that helps! Hello everyone! 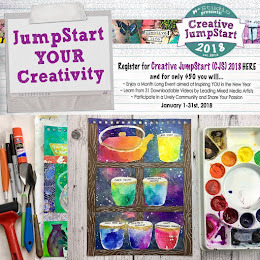 I am honored to be participating as one of the workshop instructors for Creative Jump Start (CJS) 2018--it's 7th year running--by Nathalie Kalbach. If you're not familiar with CJS, it's a one-of-a-kind online event to inspire your creativity this January 2018. 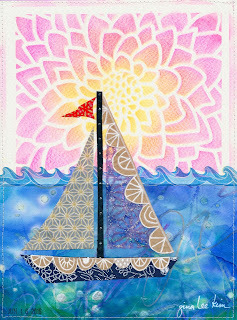 Learn techniques, discover new materials, and connect with other artists and crafters. Throughout the month of January, participants get access to 31 downloadable videos from 31 different featured artists. 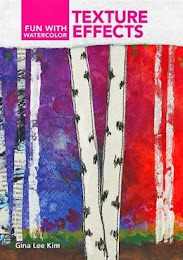 I am thrilled to be one of the instructors and I can't wait to share my watercolor & mixed-media project. Take advantage of the CYBER SALE and head on over to Nathalie's site to get all the details! You get 31 downloadable videos...that's over 6 hours of unique content for just $40 (USD) if you sign up by November 29 11:59 pm EST, 2017. 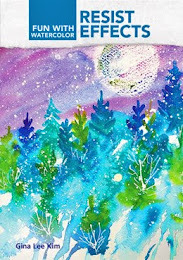 Afterwards it will be $45 until December 31st, 2017 before it goes to its normal price of $50. Current price is now $50 (USD). Hope to see you at CJS 2018! Also, be sure to check out the complete list of instructors. Thank you so much for your support. Happy Friday! 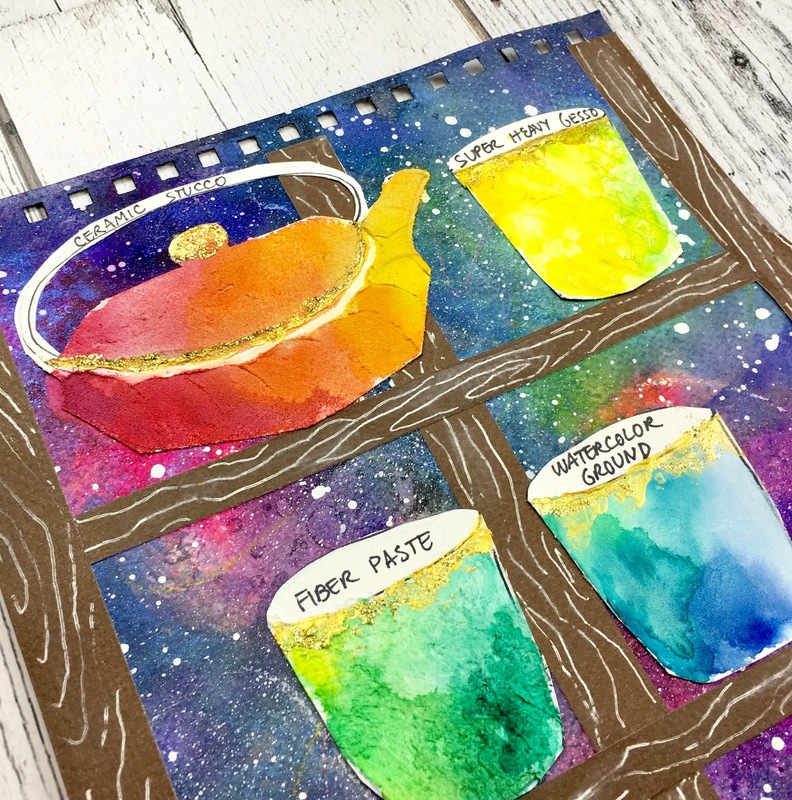 Enjoy a quick and easy watercolor mixed-media tutorial using watercolor, dimensional paste, and oil pastels. 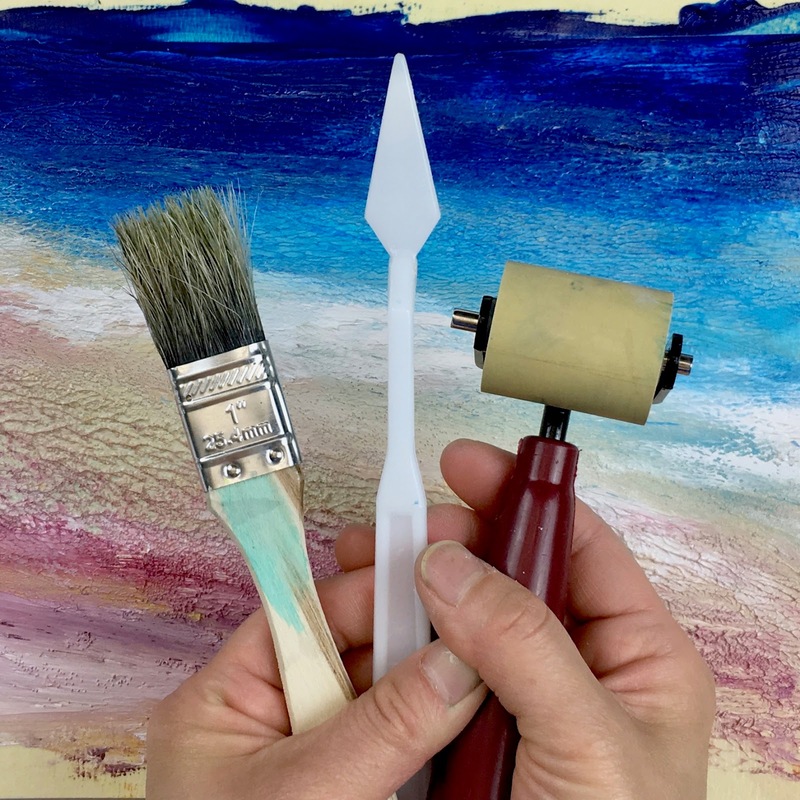 An art studio, for me, is not just an area for art-making, it is a deeply personal and sacred space we give to ourselves. For the past 13 years that I’ve been a part-time watercolorist and mixed-media artist, my studio has evolved from a kitchen island to the dining table, from inside a linen closet to the corner of a spare bedroom, and finally, after purchasing our very first home, a renovated living room that is now an art gathering place. 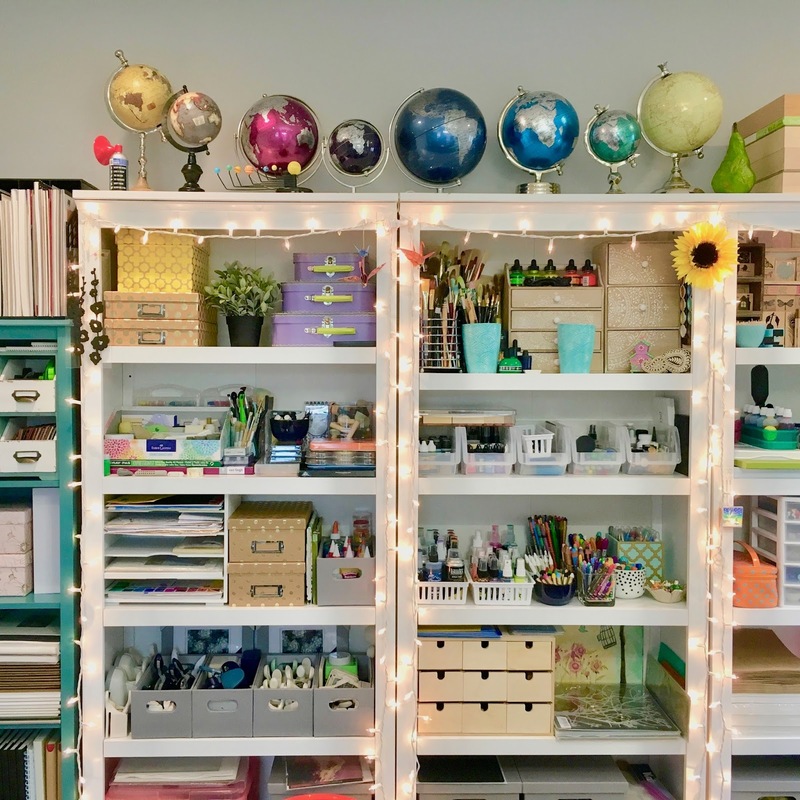 All creative spaces are tremendously precious and invaluable. They serve as incubators of ideas, a safe haven to dream, and a permission slip to play. Sometimes, I would take my art studio outdoors while on a nature walk or sitting down at a café. 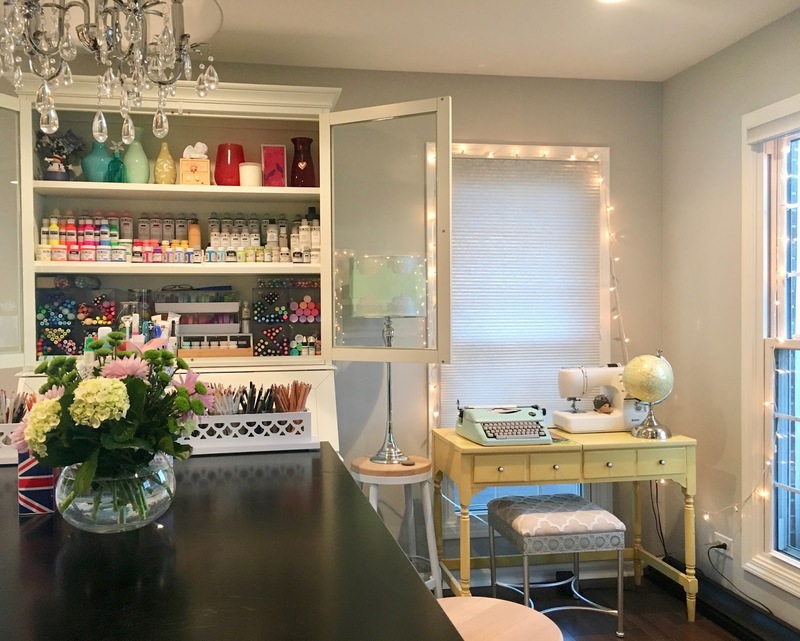 The point is, an art studio, no matter how tiny or spacious, rented or owned, conventional or unconventional, is ultimately a symbol of self-care. It is how I tune out the rest of the world so I can begin listening to myself. And as a person who craves creativity, it was particularly important to find my own artistic voice. 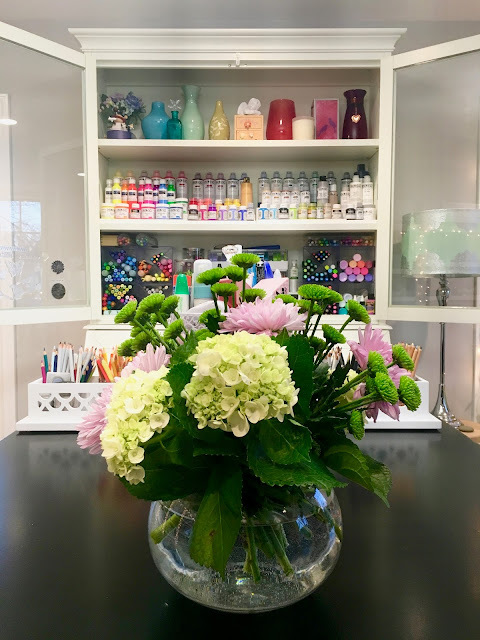 An art studio is how I began designing my life. 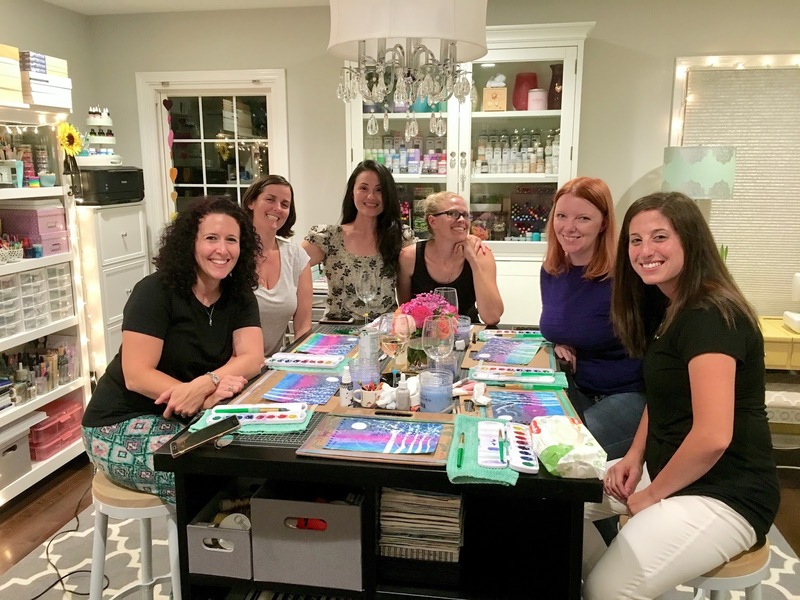 Once I had a dedicated art space, something within me changed. I took myself more seriously as an artist. I became a bit braver each day. I began submitting my artwork to magazines and built relationships with publishers. Sometimes my art submissions would get rejected, but it didn’t matter. I was grateful for the opportunity to do something daring in my life, and also that I had a physical place to return to… to start making art again. A studio setting gave me the room to grow and nurture a body of work. My wish is the same for you. Please honor yourself, your creativity, and your dreams. 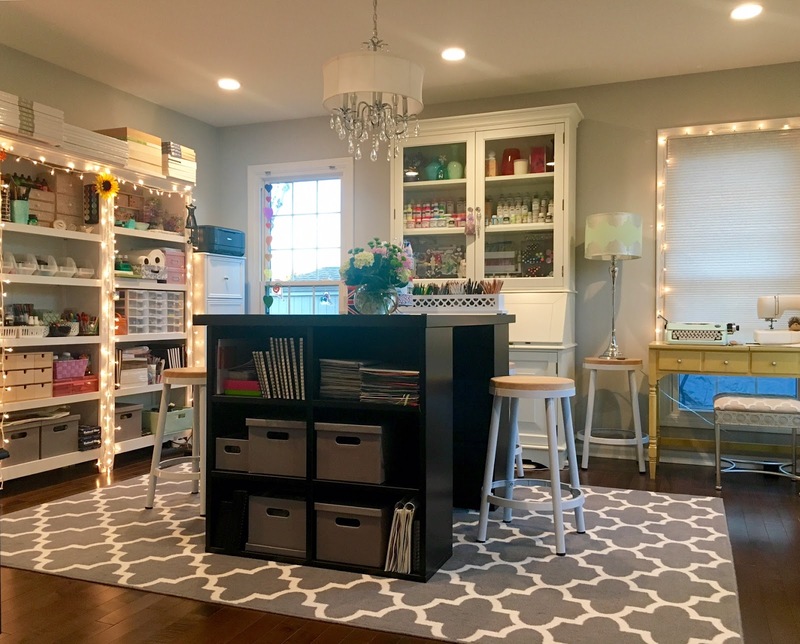 You don’t need a fully decked-out, custom made studio; a cleared corner of a desk will do. You just need a warm and inviting space with good intention. The world needs to hear and see your art. You need to hear and see your art. Hunting garage sale pieces, flea market finds, and furniture marked for clearance is how I slowly built foundational pieces for my art room. Also, Ikea is my BFF. Bookcases and bookshelves serve as great vertical storage. I use stackable boxes and trays to take advantage of every inch of shelf space. Storage doesn’t have to be expensive or uniform. You can be eclectic, thrifty, and pretty with your storage solutions. I love any design that is both beautiful and functional. Color is everything. It’s been said that your outer world is a reflection of our inner world, but I think it works both ways. When I am surrounded by calm, beautiful color, my heart feels like it’s being hugged, and I get inspired to create. Maybe it’s a cyclical relationship. I embrace a super messy studio because it means I’m blissfully creating or panicking over a deadline. 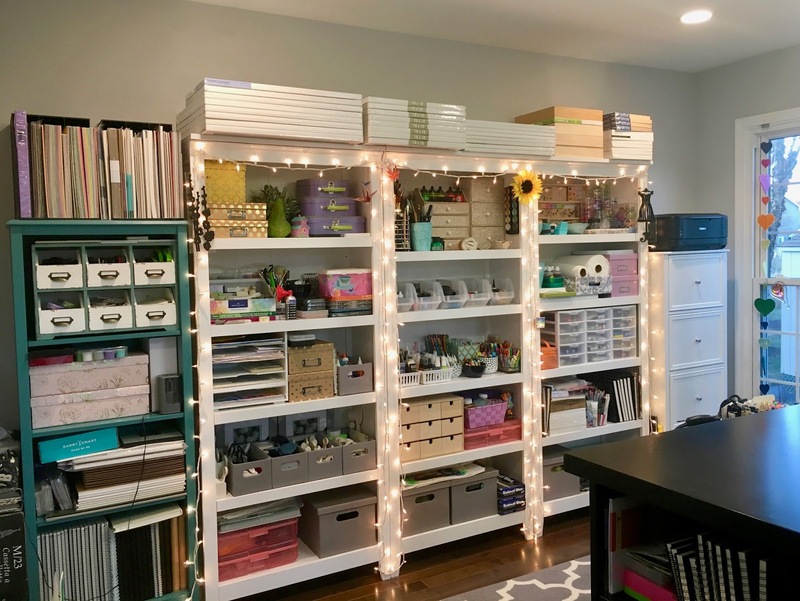 But in order for me to keep a consistent workflow, I spend a lot of time cleaning, tidying, and reorganizing my studio between projects. 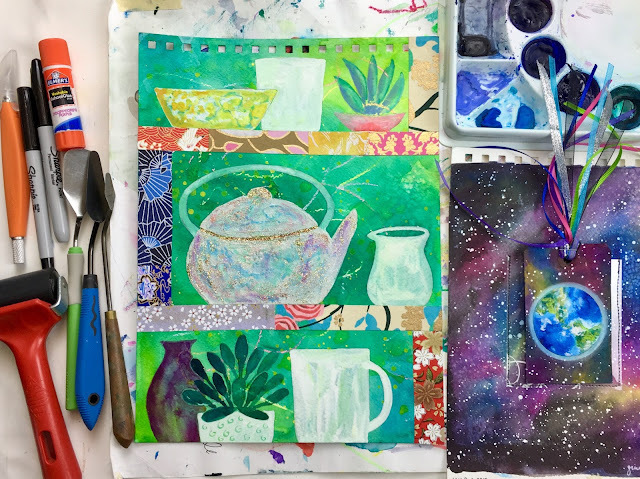 No matter how late it is or how tired I am, I make sure I leave my watercolor station all prepped and ready to go with clean water and brushes for the next project. It’s how I honor the space. I learned this honoring-of-space years ago in karate class. Whenever we entered or left the arena, we had to bow to the space as a sign of respect. Today, I may not literally bow to my art studio, but I do know how lucky I am. I make sure to respect my creative space and show gratitude by taking care of it. 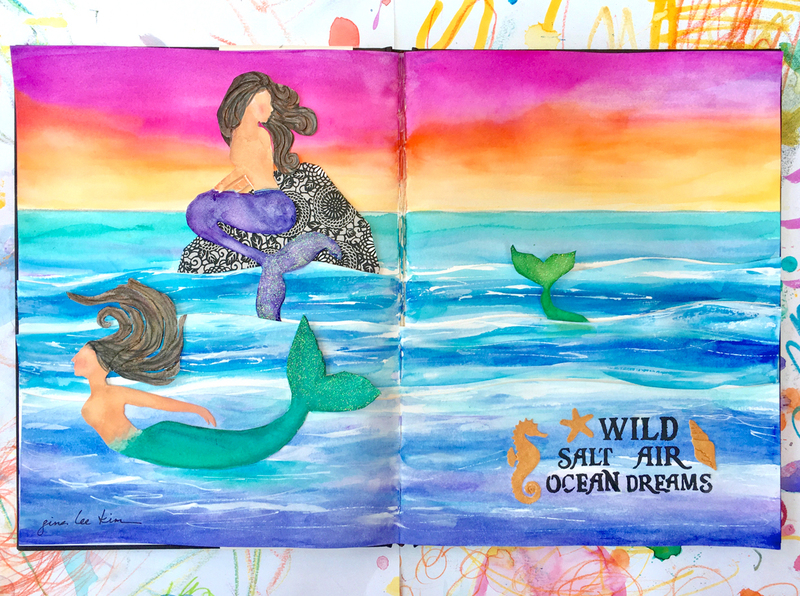 I love being a mixed-media artist and testing out new art supplies. Plus, a good portion of my art supplies come from companies that have asked me to try out their products. But after learning about the KonMari Method of organizing and streamlining, and listening to The Minimalist podcast, I realized where my anxiety was coming from. I was holding onto way too much stuff. 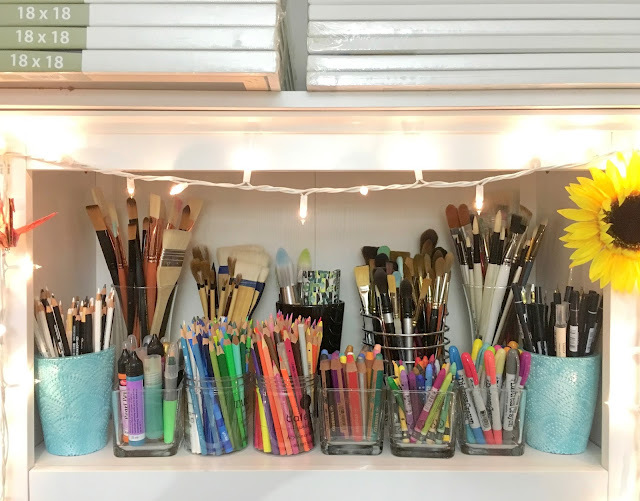 Now I treat my studio organization as a game: If I can’t find a place for an item or if I haven’t used something in a while but it’s cluttering my mind or mental space, I donate those art supplies to friends, schools, or a local charity. I want to spend less time decluttering and more time making art. 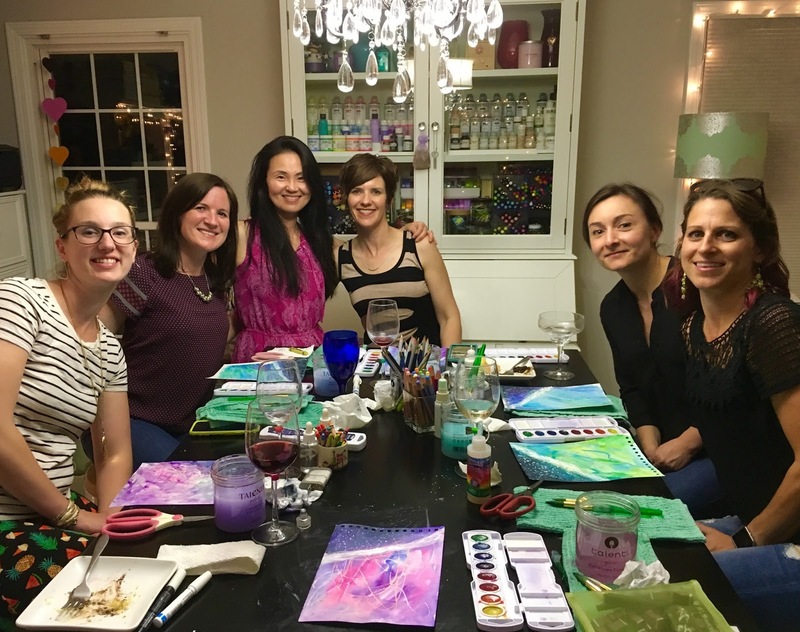 Throw an Art & Wine party! I do this about once a month in my studio space and it is a dream come true. I can comfortably fit six people, and no one has accidentally dipped their paintbrush in a wine glass yet. 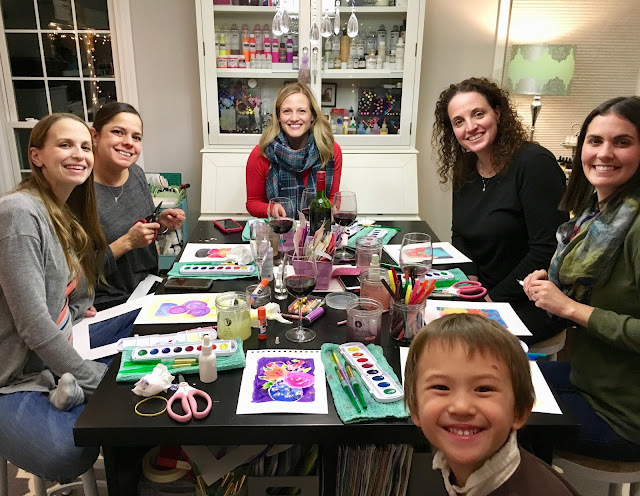 As a working artist and a mom, this it is how I fill my creative cup. 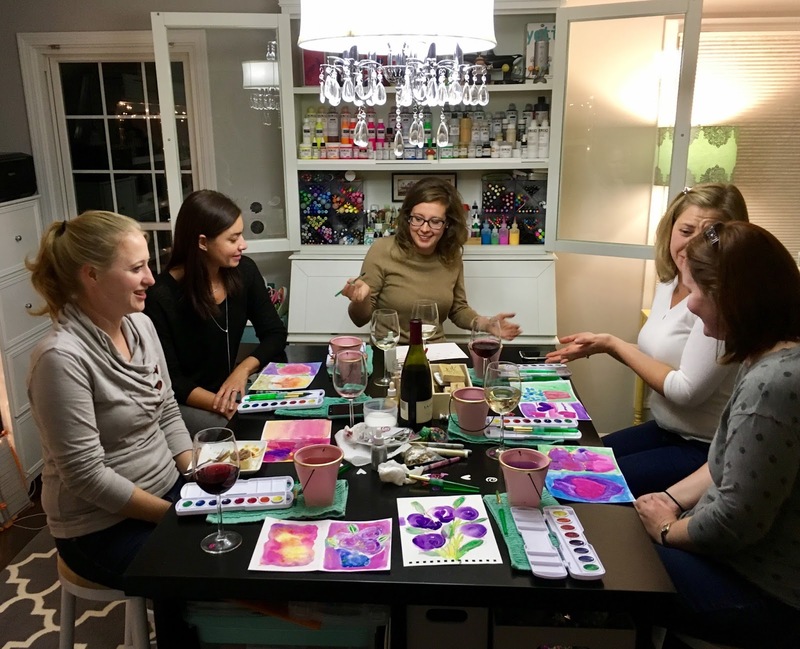 Nothing blesses a space more than sharing your life and your art skills with others. I knew I wanted to create a studio to uplift people, but the universe has blessed me back a thousand fold. Note: This writing was featured in Cloth Paper Scissors yesterday. I wanted to deeply thank my editorial director, Jeannine Stein, for approaching me and wanting to do a special studio spotlight. I am so honored. Thank you EVERYONE who has come over, blessed my life, and continues to help make this a creative, joyful space. Hello everyone! And if you're visiting from today's StencilGirl Talk blog post, welcome! 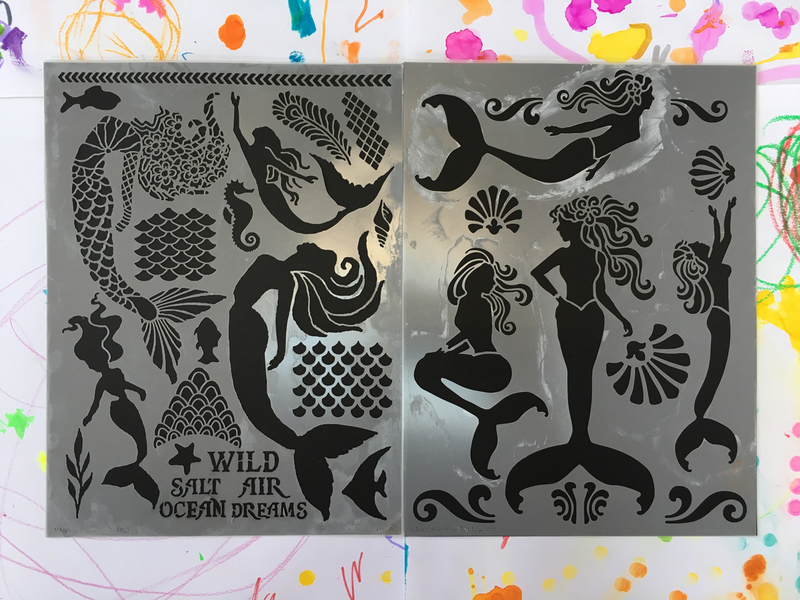 What I love about this stencil pair is how image-rich they are. Every real estate of the 9"x12" mylar surface was used! 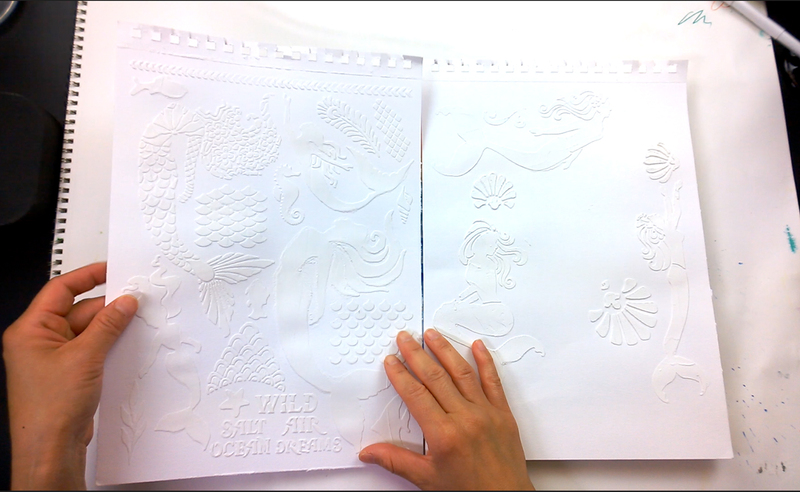 With such generous oceanic icons, textures, and figures to choose from, it was difficult to decide which image to use. 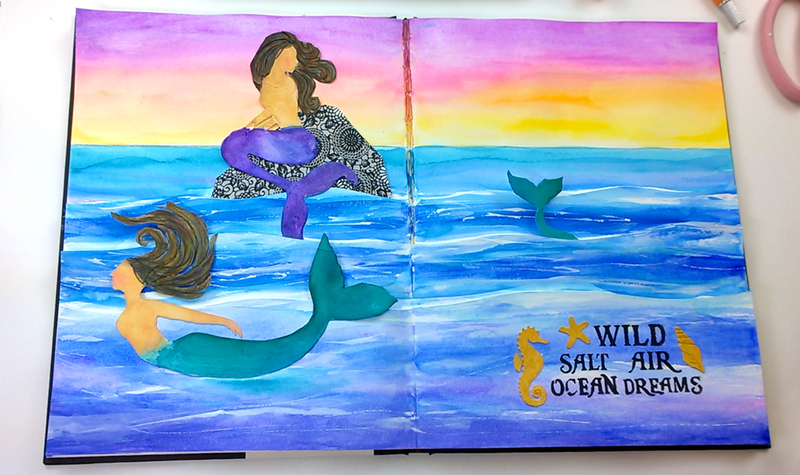 But alas, the mermaids helped guide me on my art journey. 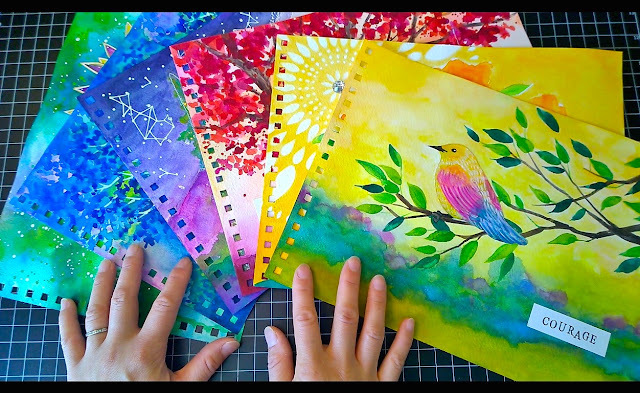 Please enjoy a tutorial video--my watercolor and mixed-media approach to using such beautiful stencils. 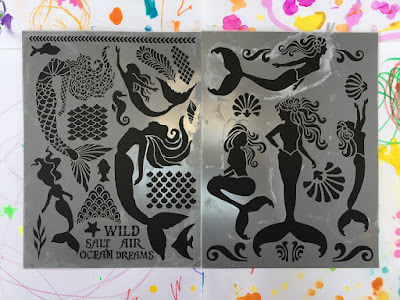 Step 1) Gather your art materials and mermaid stencils. For this exercise, you can use either light modeling paste (Golden) or watercolor ground (Daniel Smith). Step 2) Make several sheets of stenciled pages by applying the paste or ground with a palette knife. Let dry and set aside. TIP: whatever stenciled images you don't use, you'll now have a convenient supply of marine-themed collage elements to use in a different project. 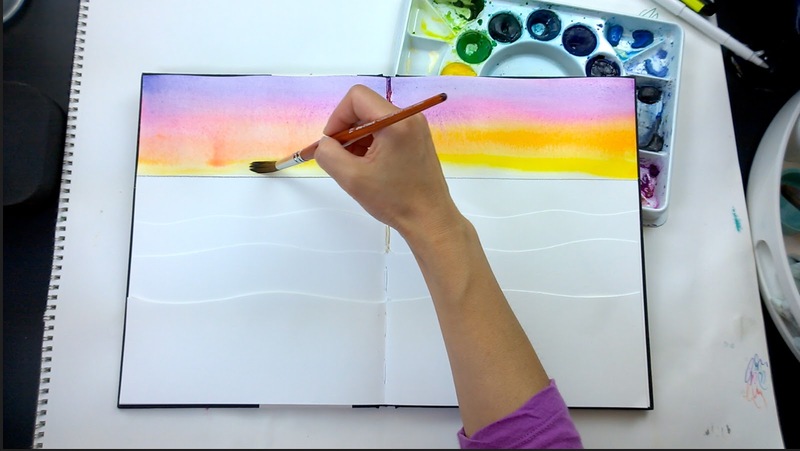 Step 3) With an x-acto knife, cut your signature pages to make several ocean wave flaps and begin painting a sunset sky with warm shades of watercolors. Let dry. 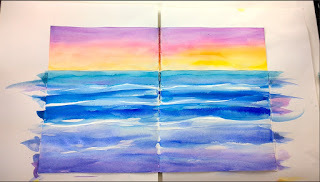 Step 4) Paint the ocean with several shades of cool blue-shade watercolors. Let dry. 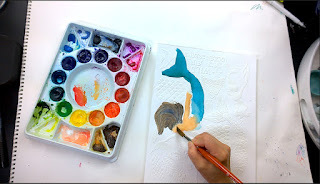 Step 5) Paint directly onto stenciled mermaids with watercolor. 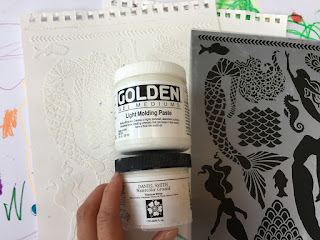 TIP: pastes & grounds will readily absorb a lot of watercolor pigment at first; glaze and repeat coats to achieve the right color and saturation. Step 6) Carefully cut out mermaids and glue all collage elements to finish your journal page. 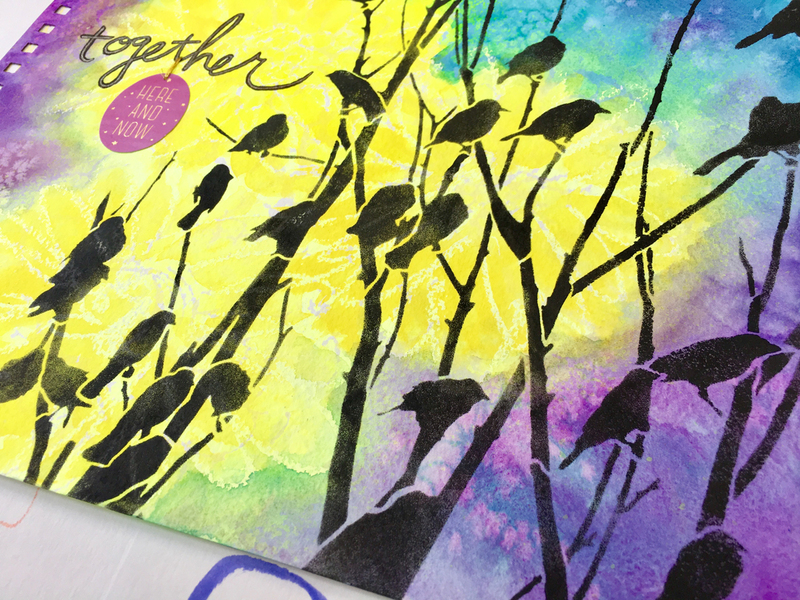 OPTIONAL: Add any touches of shimmer like glitter or metallic paints as a final detail. I also glazed the sky one more time for a deeper, richer pink (as seen in my finished photo at the very beginning of this blog post). I hope you enjoyed today’s art lesson as an easy watercolor approach to art journaling using stencils. Please stay tuned for more video tutorials using StencilGirl Products. I will announce them first via my instagram and will feature them here on my blog. and here’s a sneak peek for October. Watercolor. 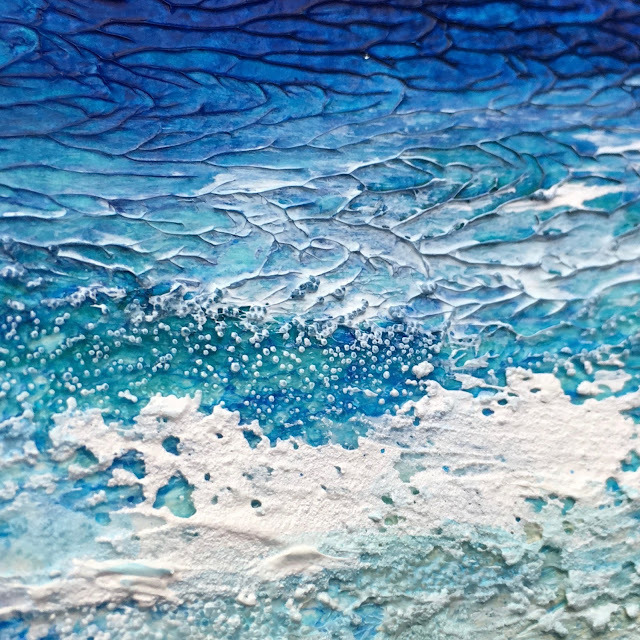 Mixed-media. 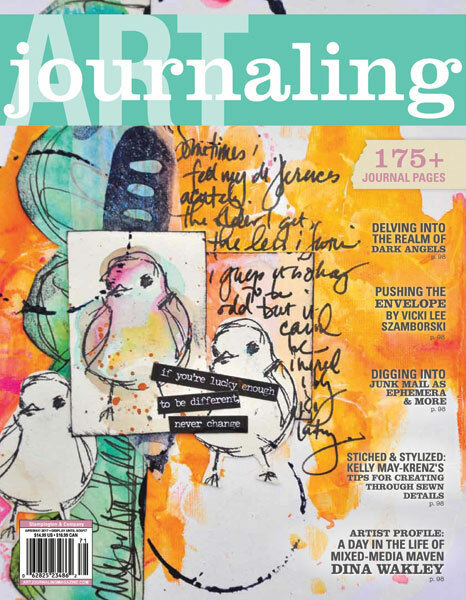 Art journaling. Wife. Mom. Nurse. Some links on this blog are affiliate links for which I receive a small commission (at no additional cost to you). Please know that I only link products I believe in. All original artwork and photo images are my own. Copyright © 2017-2018 Gina Lee Kim. All rights reserved. 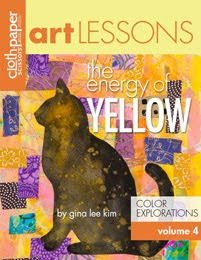 All content & images copyright Gina Lee Kim © 2009-2013. Licensed under U.S. Commons Attribution, Noncommercial, Share-Alike 3.0.